Riding on pillars of smoke and fire as it departed Florida’s Space Coast, the most powerful Atlas V streaked towards orbit on Friday to deliver the fifth and final satellite for the U.S. Navy’s Multi-User Objective System. 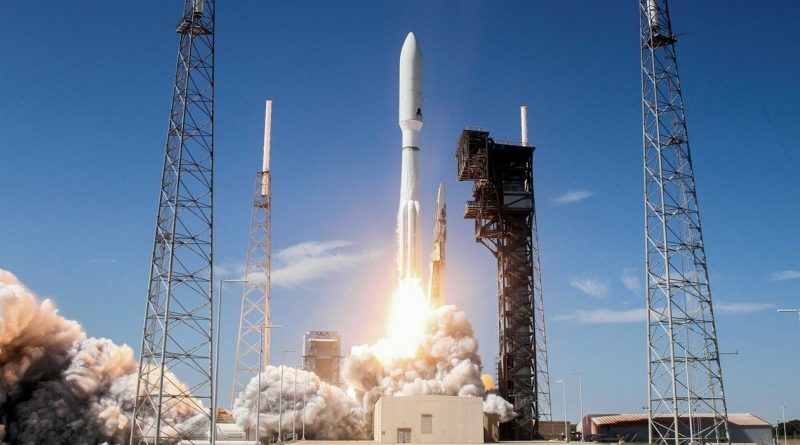 Atlas V came to life at 14:30 UTC when its powerful RD-180 engine and five Solid Rocket Boosters ignited to catapult Atlas V off its launch pad, clearing the towers less than three seconds after lifting off. From zero to the speed of sound in just 38 seconds, Atlas V departed Cape Canaveral to the south east to aim for a highly elliptical Geostationary Transfer Orbit peaking above the equator. The boosters fired for 94 seconds before dropping away from the first stage that continued firing its two-chamber RD-180 to push the stack into space. 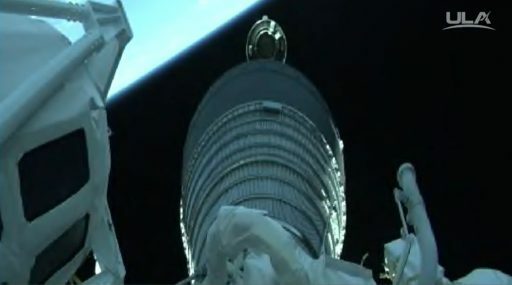 The heavy MUOS 5 satellite was revealed three and a half minutes after launch when the fairing separated and the first stage concluded its mission one minute later, handing off to the trusted Centaur upper stage. Centaur then ignited its RL-10C engine for an initial burn of slightly under eight minutes to lift the vehicle into a Low Earth Parking Orbit. A second burn of five minutes and 46 seconds raised the high-point of the stack’s orbit to over 30,000 Kilometers – setting up for a long coast phase. MUOS missions use a non-standard three-burn GTO flight profile to maximize the efficiency of Atlas V, delivering the satellite to a higher-energy orbit in order to save time and fuel during the transition to Geostationary Orbit. The third burn, coming two hours and 48 minutes after launch, raised the apogee to Geostationary altitude, lifted the perigee to almost 4,000 Kilometers and accomplished a significant reduction in inclination. 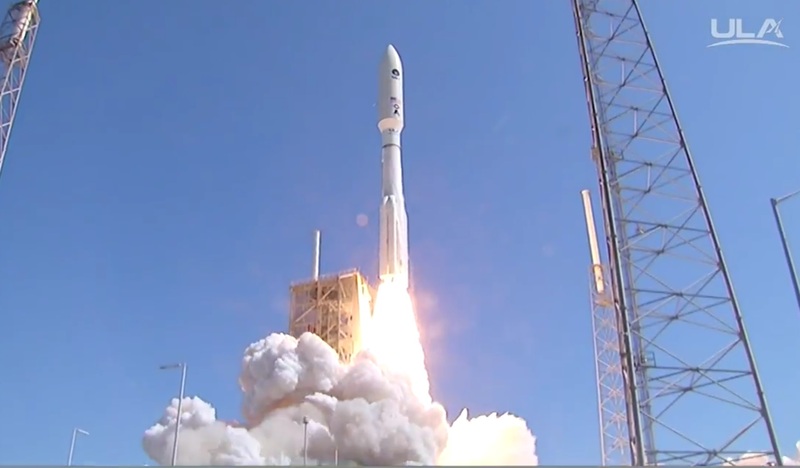 Spacecraft separation was confirmed at 17:23 UTC to mark the successful conclusion of the 63rd Atlas V launch. 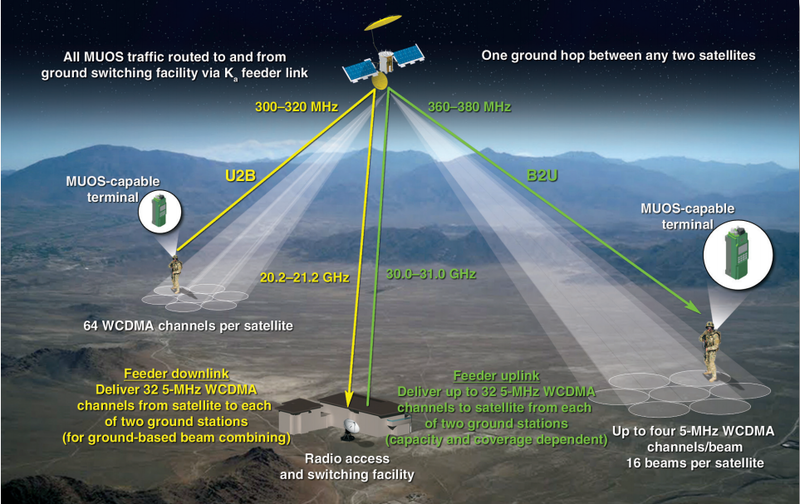 MUOS – the Multi-User Objective System, is a worldwide military communications system providing narrowband connectivity to mobile users. Four active satellites, served by four ground stations on Earth, deliver Ultra High Frequency satellite communications, primarily used by the U.S. Department of Defence with some international involvement planned in the future. 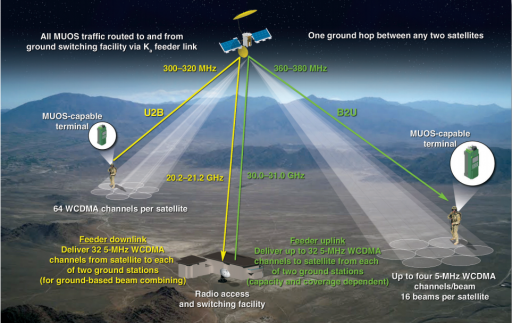 The $7.7-billion MUOS architecture replaces the UHF Follow-On System that has been in operation for two decades. The new system provides higher bitrates and uses the modern 3G communications standard also employed by cellphones. Services supported by MUOS include voice, data and video communications beyond a user’s line of sight, routed through a GEO satellite that accepts the UHF Data and converts it to a Ka-Band signal delivered to a ground station – and vice versa for downlink to a user. 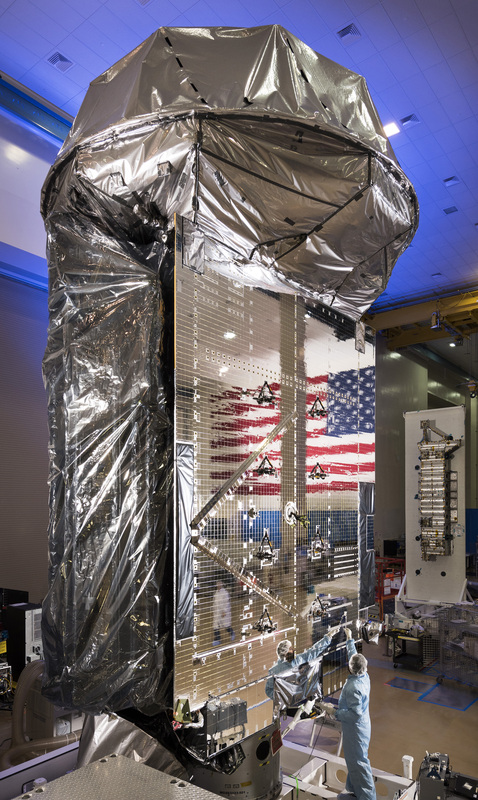 Built by Lockheed Martin, each MUOS satellite weighs 6,740 Kilograms at launch, outfitted with 5 and 14-meter gold mesh antennas that deploy once the satellite reaches its high-altitude perch to deliver 16 communications spotbeams that can be operated for netted or point-to-point communications on a global scale. MUOS delivers 10 times greater communications capacity over the previous UHF constellation and the use of technologies leveraged from 3G mobile phone and IPv4/IPv6 internet protocols gives the system a high degree of flexibility with simple integration in existing and future systems. 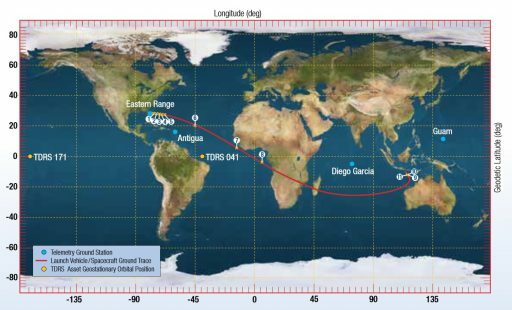 Within the MUOS constellation, the fifth satellite will enter a backup position once becoming operational around mid-December. It will be ready to be moved to any location within Geostationary Orbit to take over from one of the four primary satellites in case of problems. The satellite is also available to reinforce communications capacity in cases of larger demand. The MUOS constellation began deployment in February 2012 when the first satellite headed into orbit to cover the Pacific Region. 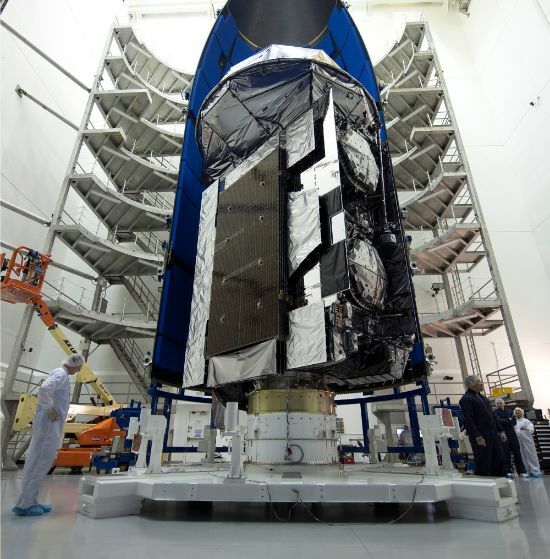 MUOS-2, covering the Americas, followed in July 2013, the third satellite entered orbit in January 2015 to cover the Atlantic. MUOS-4 headed into orbit in July 2015 and entered a location of cover the Indian Ocean. Over the next two years, the ground infrastructure that mostly relies on heritage systems at present, will phase in new radio terminals to deliver the full data speed and security MUOS is capable of. For the launch of the hefty MUOS satellites, Atlas V flies in its most-powerful 551 configuration, enlisting the help of five Solid Rocket Boosters to provide the kick needed to get Atlas V off the ground and into its high-energy orbit. Friday’s launch marked the 7th flight of the 551 version, having launched all previous MUOS satellites and NASA’s New Horizons probe that flew past Pluto last July and Juno that is currently inbound to Jupiter for orbital insertion on July 4. The team at Cape Canaveral Air Force Station entered countdown operation at 3:40 a.m. local time to set up for a 10:30a.m. liftoff. 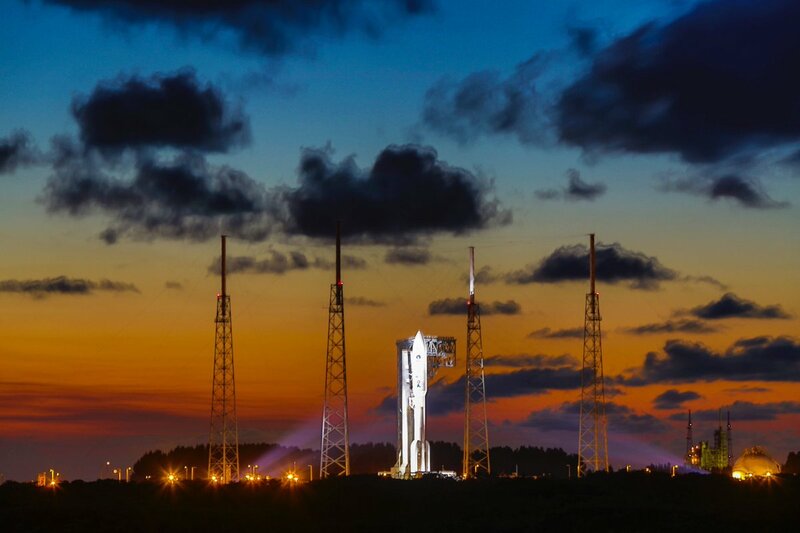 Countdown operations kicked off with the activation of the Atlas V for a detailed set of checkouts while teams at SLC-41 were still busy closing out the base of the rocket and the various ground systems. The launch pad was vacated by L-3 hours and a check of all stations confirmed readiness for propellant loading on the two-stage stack as soon as resuming the countdown from a scheduled hold at T-2 hours. Work to load the Common Core Booster and Centaur Upper Stage with cryogenic propellants picked up with a chilldown of the various propellant lines and ground systems before the tanks were conditioned and the supercold liquids started flowing into the tanks of the 62-meter tall rocket. Tanking started with Liquid Oxygen loading on the first stage, being filled with 185,500 liters of the -183°C oxidizer. 94,600 liters of Rocket Propellant 1 had already been loaded into the booster prior to the start of the countdown. 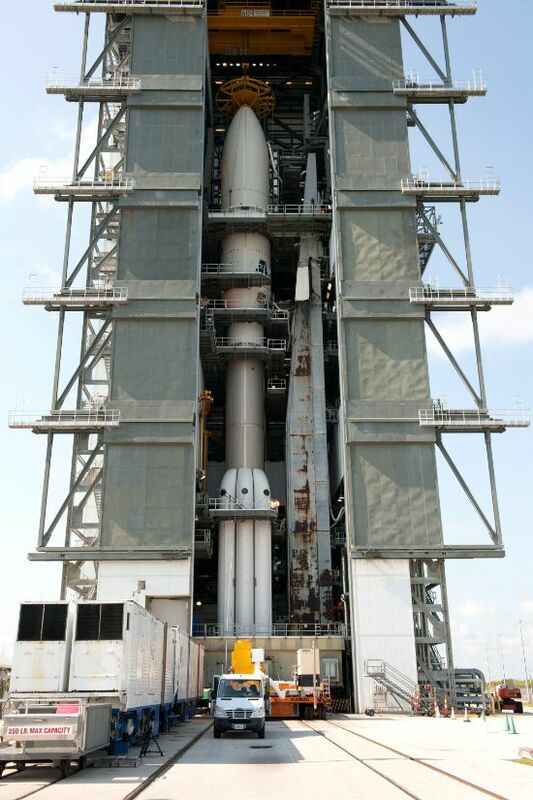 Centaur, the trusted upper stage with over 200 flights under its belt, headed into propellant loading a short time later to receive 15,700 liters of LOX and 48,100 liters of -253°C Liquid Hydrogen. Propellant loading was by the book and teams headed into final flight software load and preparatory steps for the Automated Countdown Sequence. 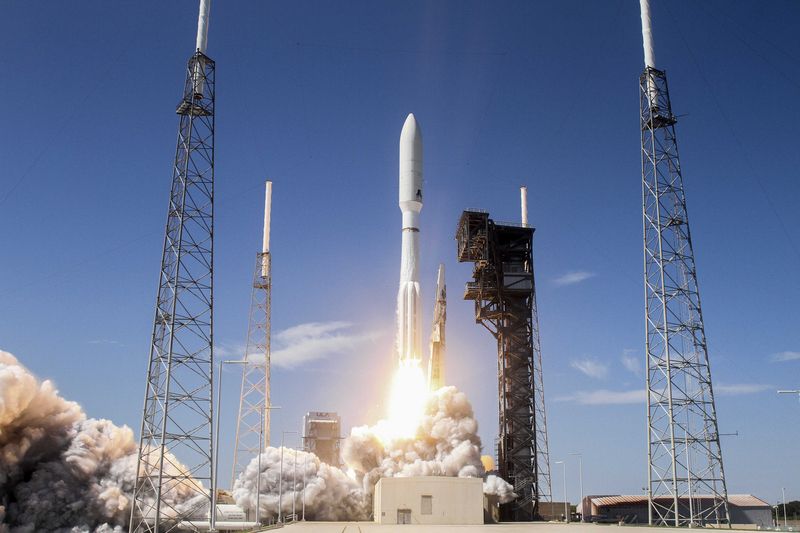 With Atlas V at flight mass – 587 metric tons – and MUOS 5 running on battery power, all stations provided a GO to press into the computer-controlled sequence of the countdown. Over the last four minutes, Atlas V switched to battery power, pressurized its tanks and assumed full control of the countdown leading up to ignition. The two-chamber RD-180 engine rumbled to life three seconds before liftoff to ramp up to its liftoff thrust of 390 metric-ton-force, carefully monitored by computers before the ignition of the five boosters was triggered to commit the vehicle to flight. 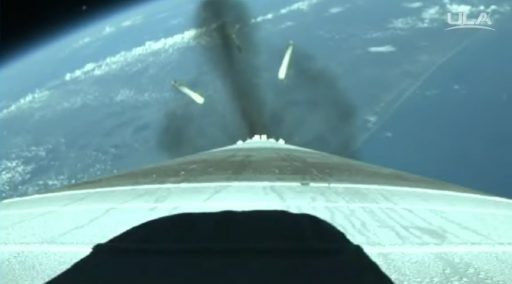 Upon ignition of the five Aerojet Solid Rocket Boosters at 14:30:00 UTC, Atlas V jumped off its pad with a total thrust of 1,250 metric-ton-force. Shooting uphill, Atlas V started pitching and rolling onto its planned departure path just four seconds after lifting off. 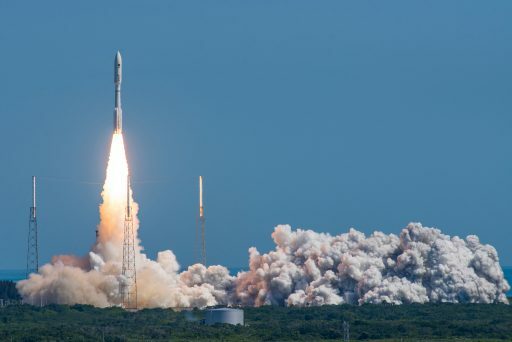 After 38 seconds, Atlas V had already passed the speed of sound and another 12 seconds later, the vehicle encountered Maximum Dynamic Pressure for which the RD-180 throttled back to limit stress on the ascending vehicle. Chamber pressures on the solids dropped at T+94 seconds as each had burned through a 41,000-Kilogram supply of propellant. Separation of the boosters occurred at T+1 minute and 48 seconds in staggered fashion with two boosters departing the rocket 1.5 seconds ahead of the remaining three. Continuing powered flight on the RD-180 alone, Atlas V was relying on a fix implemented after the Cygnus OA-6 mission to avoid a recurrence of the Mixture Ratio Control Valve anomaly that caused a close call during the March 23 mission. 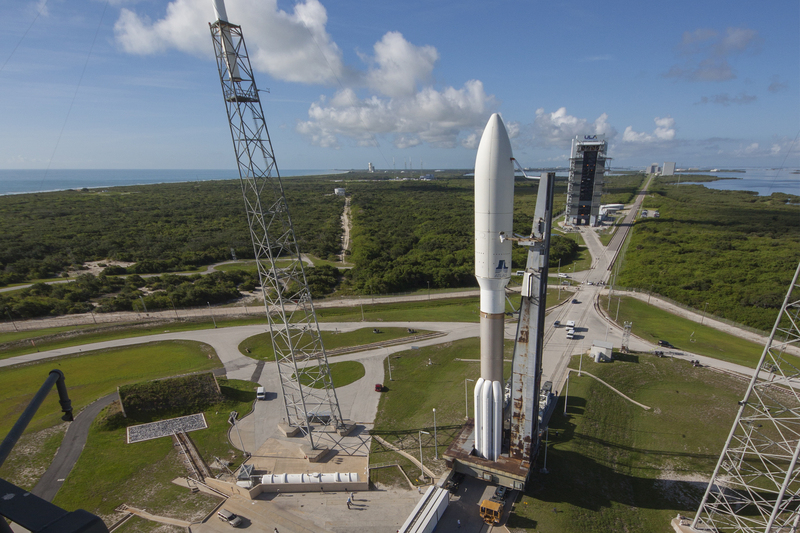 While the Cygnus mission had sufficient margin to make up for a loss in performance on the first stage, the launch of the heavy MUOS satellite did not have the luxury of much leftover propellant on the second stage. The two halves of the Payload Fairing dropped away from the vehicle three and a half minutes into the flight when Atlas V had cleared the dense atmosphere. Revealed for the rest of its ride into orbit, MUOS 5 was receiving a smooth flight by the Atlas V, gearing up for staging by again reducing thrust on the RD-180 engine. Shutdown of the engine occurred at T+ 4 minutes and 26 seconds followed six seconds later by the pyrotechnic separation of the spent booster, pushed away using solid-fueled retrorockets. Centaur fired up its RL-10C engine at T+4:41 and reached its full thrust of 10,800 Kilogram-force for a planned burn of 7 minutes and 47 seconds – lifting the stack into an elliptical Low Earth Parking Orbit of 157 x 661 Kilometers, inclined 28.3 degrees. The first upper stage burn was by the book and Centaur headed into a coast phase of exactly eight minutes so that the second burn could center the equator and thus raise the apogee of the orbit to a position over the equator on the opposite side of the planet. Centaur re-started as expected 20.5 minutes into the flight and fired the RL-10 for five minutes and 46 seconds – lifting the apogee altitude of the orbit to over 33,930 Kilometers, also slightly reducing the orbital inclination to 25.8°. Having completed its burn, Centaur flew over Africa before a long overflight of the Indian Ocean as part of a two-hour and 22-minute coast phase. This long passive flight phase was implemented to allow Centaur to climb to around 25,000 Kilometers in altitude where another burn would result in the apogee climbing to Geostationary Altitude, the perigee being raised to almost 4,000 Kilometers and the inclination to be reduced to 19.1°. The 58-second RL-10C burn aimined for an orbit of 3,841 x 35,707 Kilometers for spacecraft separation at T+2 hours and 53 minutes north west of Australia. After separation, Centaur completed the usual avoidance and passivation maneuvers while MUOS 5 took its first steps in orbit, looking forward to eight days of orbit raising. 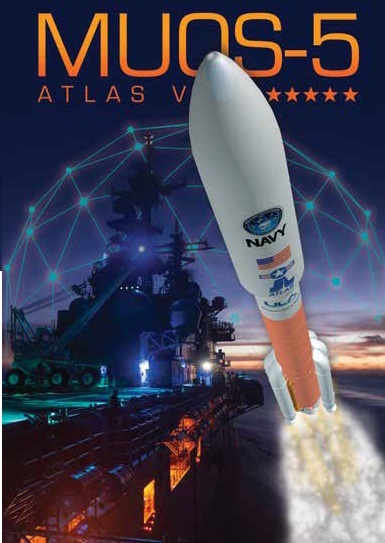 Copyright © 2019 Atlas V | MUOS 5 | Spaceflight101. All rights reserved.